I never did get my palm (tealeaves, cards) read, but mother did have lots of friends who did. Once we visited a fortune teller with a couple of mother's friends--just for fun. Most of her friends after she got divorced were single or divorced women and I don't think the psychic had to be too psychic to figure out what they wanted to hear. I imagine that such people are pretty good backyard psychologists anyway, having heard the same story over and over and facing the same kind of clientele every day. I know that we who worked in the library faced patrons whose problems we could anticipate before they opened their mouths, and I imagine the fortune tellers have the same experience. My fortune-teller came at me from a different and somewhat circuitous route. I parked my beaten up old car in the supermarket parking lot one day, and when I came out a man offered to fix the car body in my driveway. I agreed, and he told me to order the part from a dealer, which I did. When the part came in, I called him. The man could have been sent from central casting; he looked exactly as a gypsy is supposed to look: dark complexion, dark eyes, and wearing a lot of gold in the form of chains. He called me and asked me to come to his house, so I did. The house, on a formerly residential but now heavily traveled commercial street, had a big sign in front advertising a psychic. I had driven by it many times and often wondered about it. He called me back with a price and suggested that cash would suit him fine. So I took my body part and went over. While he fixed my car, I sat in the kitchen with his wife. To pass the time, she offered to tell my fortune at a very reasonable price and I agreed, to pass the time. Her reading revealed nothing new or startling and I spent the remaining time watching her husband whack and bang my car back into shape. I'm assuming they were gypsies; at least they lived up to the stereotype. So if they weren't, I offer my apologies. I paid the asking price in cash and never saw them again. I will say that, gypsy or not, he fixed the car at a reasonable price and didn't overcharge me as various dealers have over the years. I can't feel too sad over the sad plight of said dealers, judging by the way they treated me. The gypsy was a pleasure to deal with, in comparison. 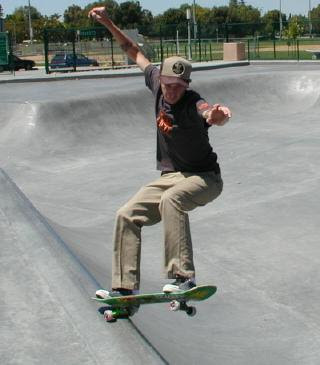 I noticed some boys skateboarding. They made it look easy and effortless, like sunfish sailing in the wind, except they weren't being driven by the wind, just moving by shifting their balance from side to side. They reminded me of birds, so smoothly did they soar. I was filled with wistful envy, as I am whenever I see people performing with great skill, violinists perhaps, or dancers. I couldn't do something like that to save my life. It was all I could do to ride a bicycle as a child. I borrowed a lot of his readers. They brought (fictional but highly welcome) beer, wine, hard liquor, barbecue, flowers and chicken soup with the chicken still swimming in it. It was greatly appreciated while it lasted. Not watching it drunk, not watching it sober. I actually settled down with a glass of seltzer and a couple of pain pills (post-surgery) to watch it. But then I started to notice Joe Biden's head going up and down like a hairplugged, toothcapped bobble doll. I gave up. Recovering from surgery should be easier than this. I watched the assorted riffraff come in and take their seats. They were all maneuvering for face time with The One. I remembered the last SOTU I had watched, when the same parties struggled to be photographed with Bush and then went home and called him a war criminal. And worse. These Congresspersons are always either at your feet or at your throat. Looking at all the crooks and liars standing and cheering, I realized that I had changed. I used to give these guys the benefit of the doubt, even a year ago. Good will to men (and women) was my mantra. Now the mask has been ripped off, and I see them for what they are. Crooks and liars, until proven otherwise. Looking at this bunch makes you doubt the validity of the theory of evolution. Humanity has evolved into this? Now how about getting something on Eric Holder? I once contributed my thoughts, such as they are, to s blog group which will remain nameless. I sent them my stuff, they published it, I got comments, everyone was happy. Then I started to write reviews. One or two were published in boston.com, which I admit was fun for me. I sent in more reviews, generally of books. They published them for a while, then started critiquing my work, finding flaws and making suggestions. I complied at first. More criticism ensued. The editor seemed to think she was editing the high school year book at a school for the mentally challenged. She had an unpleasant way with words, combining pomposity with pretentiousness. One particular sort of criticism caused me to re-think my position. I submitted a review which was, in the opinion of the editor, too brief. Too brief for who? I am a person of few words; when I've said my say, I have no more to say. Plus, and this was the clincher: they're not paying me! So I get to say what I want. If you pay me, you get to tell me how to write. Otherwise, not so much. Nobody has to read my blog. So far as I know, no one has had my blog assigned as required reading by a teacher. It does not appear in any list of recommended fine writing. I blog mostly for myself. Anyone who wants to come along for the ride is welcome. So--I'm having surgery on my right arm tomorrow. Possibly I will be typing soon, probably not. I already know what to expect, if this is like any other surgery: pain, tedium, frustration, tedium, pills, blood leaking from bandages and trying to take a shower with one arm in a plastic bag. (It doesn't really work. The arm, or leg, or knee, or foot, gets wet anyway.) Sort of. I've always wanted to do what Tim Blair does. Talk among yourselves, you readers. Please use English, good grammar, proper spelling, and all the political incorrectness you can muster. since Obama became president. Feel the love. Lots of cardboard, plus foam, and 1 steering wheel, two axles, four wheels, four tires, a transmission, a motor, a collection of body parts, and a box of nuts, bolts, hinges, screws, etc. very poor directions for putting the thing together by yourself. Imagine, further, that you had problems assembling the thing, and called or e-mailed the Whatsit Motors website, only to be informed that, for really helpful help, you had to pay. Imagine, therefore, that you decided to pay someone to come to your house to assemble it, and it cost about one third of the purchase price of the car. Welcome to my cell phone world. Let me back up a bit. My GPS got lost or stolen, and it costs $200 to replace, so I got a new cell phone with built-in GPS free. It also has internet, texting, and a camera that's not too bad. I figured out the camera, not that I need another camera. I think I transferred my address book. But I haven't figured out how to set up the GPS or how to connect to the Bluetooth device I bought for the car. Or how to mount the phone in the car. So I have to read the manual(s). I can't tell you how much I hate these manuals. The first page tells you what all the parts are--that I understand. After that promising beginning, confusion reigns. It's my fault--my mind does not work in a 21st century way, I'm stuck back in the 20th century. Maybe the 19th. Anyway, I approach these with trepidation, frustration and an overwhelming desire to lie down and have a long cool drink of something while placing an ice pack on my forehead. It's nice of him to feel we are wonderful. I love England myself. I think it belongs to us as Americans in a very special way. The United States is an outgrowth of English law and custom, and we Americans are more at home there than we are in other places in Europe. Another neat thing: they speak English. I don't think the English are less friendly or polite than we are. They just have less room to move around. It's a crowded country, and the English have learned to protect their private space. They are awfully good at crowd control and at lining up in an orderly fashion. We, on the other hand, have an enormous country to move around in. So we can afford to be expansive. Pretty damn mild, for a racist remark. I'm an ardent Reid non-supporter. I believe he's far from the sharpest knife in the drawer, but if this is as racist as he gets, I say we should forget about it. I sort of understand what he was trying to say, and so does everyone who has lived beyond the age of twelve. He did not express himself well, but then he never does. I'm sick of all this petty stuff. Obama continues to play golf when an airplane is almost blown up. So what? He had a telephone and staff with him didn't he? If he needed to know something or decide something, he could do it. If he wanted to have a press conference or make a statement, he could do that. Some things are important and speak to character. Ben Nelson's sellout of Nebraska was deplorable and reveals a lack of moral compass. That's important, and serious. But the most deplorable action any American political figure has taken in my lifetime was Ted Kennedy's leaving a woman to die in Chappaquiddick. Liberals give him a pass because he did so much that was good for the country, in their eyes. But it was an indelible moral stain on his character. Other politicians have performed illegal actions and made idiotic remarks, and of course most of them are stealing us blind. That's a given. But no one died as a result. Let's deplore what's really deplorable and forget about Michelle's clothes and Harry's remarks and whatever other gotcha moments that come up. I thought it had an offbeat charm. Looking out the window here, I must say Cuba is looking rather good right now. It's not snowing there, right? 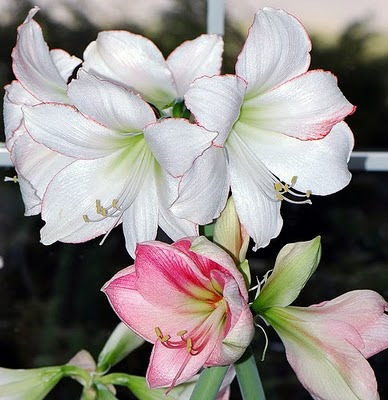 We saw beautiful amaryllis at Longwood Gardens, in a splendid array of colors, and I was reminded of a song: either by Thomas Campion or by anonymous, depending on which source you believe, about sweet Amaryllis, a wanton country maid. I wish I could figure out how to include a song in this post, but it's late at night, and I can't. However, if you click on the heading you will find a lot of o songs that are available for copying. Amaryllis is a pretty, old-fashioned name. Along with Phyllis, it is featured in a lot of old songs, because it is a musical name and sounds pretty when sung. Why are some names for children popular while others are not? Emma, for instance, is at the top of the list of girls' names. As a name, it's just okay, nothing special. Some old-fashioned names are making a comeback, like Phoebe and Olivia, others, like Mabel and Florence, not. Then there are the truly awful names, among them Destiny. If Destiny, why not Epiphany? If Grace, why not Hope and Charity? If Brittany, why not Bethany? 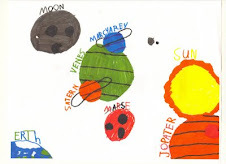 Boys' names are not quite as fanciful. Baby boys born nowadays tend to have Irish-sounding names: Brian, Kevin, Aidan; or biblical: Adam, Benjamin, Jacob. Sometimes they have the names of English kings: Henry, James, Charles, Edward. The Gin Craze was a period in the first half of the 18th century when the consumption of gin became popular with the working classes in Britain - especially in London. There ensued an epidemic of extreme drunkenness that provoked moral outrage and a legislative backlash which some compare to the modern drug wars. 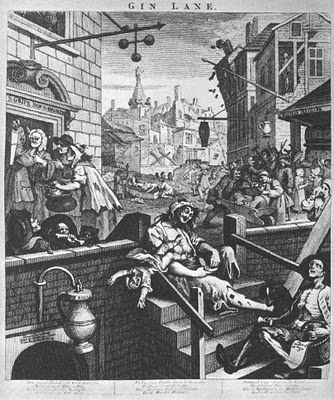 This was the direct inspiration for Hogarth's Gin Lane. A popular saying was: "Drunk for a penny, dead drunk for tuppence." Binge drinking in the UK. Go read it and look at the pictures. Racial or religious profiling is morally wrong and likely to be counterproductive by radicalizing those subjected to it. Oh yeah? Does this mean that every black man who can't get a taxi because of his skin color will become a terrorist? I don't think so. Ny New Jersey neighbor (black) told me his teen-age son was always being stopped by cops, but though he regretted it, he saw where the cops were coming from. My grandson, a young but dark man, has been stopped on more than one occasion but has not become embittered or radicalized. As a minority myself, albeit not a readily recognizable one, I've heard remarks about Jews which I considered offensive. They were offensive. But all it caused me to do was lose respect for the person uttering the remark. You can't always react to every offense. Sometimes it's better to let it go. I have been awfully cranky lately. Everything seems to be breaking. The washer, which cost about $400 a couple of years ago, broke. No sense repairing it, which would cost maybe $200. So I bought a new one. My computer! the non-functioning CD burner made it impossible to download the software for my new camera so I tried to get Nikon to download the drivers, but they couldn't do it, because the computer was 64 bits, apparently something which had not ever happened in the history of the Nikon company and they were sorry but it was getting late and customer service wanted to go out for a cigarette anyway, so I sent the camera back to Amazon. I must admit I felt a twinge of satisfaction when I got rid of it. Take that, Nikon! The small television/DVD player that cost $300 and will not recognize a CD inserted in it any more is at the repair shop. It would cost too much to replace, as well as too much to fix. Heads you win. Tails I lose. Did I mention the hinge on the dishwasher which is causing the door not to close properly unless you twist it to the left? Probably not. Another appliance that costs too much to fix and too much to replace, so that whatever I do--get a new one or fix this one--I feel like a sucker. I'm not claiming that manufacturers are deliberately making things that are so shoddy they break down. It's not a conscious decision on their part; it's just the result of them all taking their I Don't Care pill every day upon arising. They're hoping it won't break, but if it does, so what? Not their problem--the warranty just ran out. Mr Charm has decided that he will no longer attend movies in theaters. He says the music, particularly in the previews, is way too loud. I saw Sherlock Holmes on Christmas Day. The music was way too loud. There ought to be a ban on drum rolls in movies, along with cimbals, trumpets, and the little thing they hit with a stick. Does the guy who plays the little thing you hit with a stick have to audition? Just thought I'd ask. I only liked one thing about the movie, the song The Rocky Road to Dublin. It sounded like it was sung by Tommy Makem, but I could be wrong. And it was played way too loud. Oh, and to be fair, London looked nice too, but awfully crowded, more like Calcutta than London.